A United Nations sub-committee is trying to get rid of baby boxes. Baby boxes are drop boxes found at hospitals and houses of worship where parents can anonymously leave their unwanted babies. 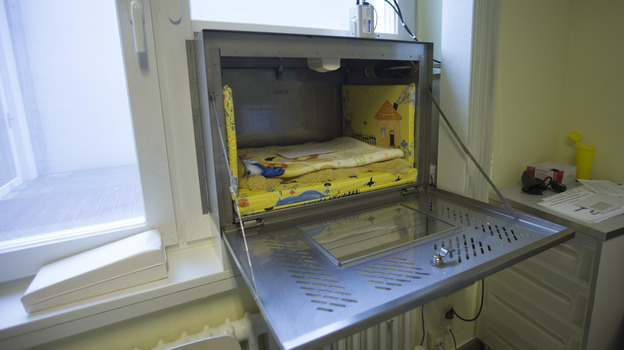 They open the hatch, drop their baby in the compartment, close the hatch, and then the baby appears inside a safe, warm, haven. The U.N. is working on banning the baby box practice internationally. They say that these baby boxes encourage parents to dispose of their children. Um, duh. That's a positive! Babies take a lot of time! Why not use that time to write a book or go on a vacation? Thanks, baby box! Baby boxes should be called time machines. What if you put the baby in a box on a three-day weekend? All the employees and nuns have three days off. Three days go by before anybody gets there to feed the baby and suddenly you have a dead baby box. What if the abandoning parent drops off triplets? Too many babies in the box and they'll run out of air. Again, dead baby box. Microwaves look a lot like baby boxes. What if you confuse the two? The baby goes from safety to tasty. It's possible keeping these abandoned babies around could produce great results. Just in case, though, they should add an incinerator option. If the baby's name is Adolph, if their last name is Bush, or if the baby has too many tattoos, press the button. By the way, this week's Battery Podcast episode features some great clips from my Thanksgiving Day show at the WPBR Radio Room in Greenville, South Carolina. Check it out!